Dialysis is where a machine is used to replace a kidney after kidney failure. The word dialysis comes from the Greek word dialusis, dia meaning through, and lusis meaning loosening. Dialysis can be used for people who have become sick and have lost the use of their kidneys for a short time, or for people who no longer have working kidneys. The purpose of the kidney is to keep a balance of water and minerals in the body. These minerals include sodium, potassium, chloride, calcium, phosphorous, magnesium and sulfate. The kidneys also take out hydrogen ions from the blood. Dialysis is able to remove these wastes from the body and help keep the minerals in balance. However the kidneys are also part of the endocrine system and make erythropoietin and calcitriol. Dialysis machines are not able to replace this part of the kidney's function. Dialysis machines work by using diffusion and ultrafiltration. A very fine material, called a membrane, allows blood and fluid to flow through it. In the machine, the blood flows in one direction, and on the other side of the membrane, a special fluid, dialysate flows in the opposite direction, this process is known as osmosis. Dialysate is a fluid that has different chemicals in it, such as potassium and calcium. A doctor would decide what mixture of chemicals would be needed for each patient. The dialysate has bicarbonate in it to lower the higher acid levels that these patients often have. The blood and dialysate mix together. The waste products are removed from the blood and caught up in the fine membrane. 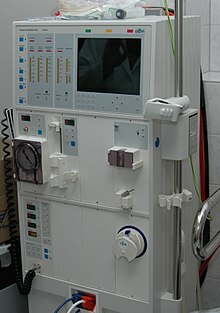 A dialyser is part of a dialysis machine. The dialyser filters blood like a kidney. It is made of a clear hollow cylinder with two inlets and two outlets. One inlet and outlet is at the upper side and downside which are for blood entrance and exit before and after purification. The other inlet and outlet are beside through which a supporter liquid goes into the dialyser. A dialyser has very thin fibres of cellulose. The fibres work as a semi-permeable membrane (SPM). There are about 10,000 of them. Impurities such as urea keratin leave through the SPM. Blood cells cannot go through because the blood cells are bigger than the impurities. The whole process of purification is supported by a liquid called dialysate. Dialysate is sent into the dialyser by the pump situated in the dialysis machine. The pure liquid goes in and the impure dialysate comes out. Dialysers are also called artificial kidneys. This page was last changed on 9 September 2017, at 09:02.